Transfield has been doing it tough over the last year. So we’ve decided to help out the concentration camp company by hosting a Competitive Selection Process (not at all tender though) for a new name and logo for the company that — as their recent Annual Report stated — cares for asylum seekers on Manus Island and Nauru. THE DESIGN BRIEF: Design a name and logo that imaginatively encapsulates the quest to glean economic value from misery, desperation and racism. 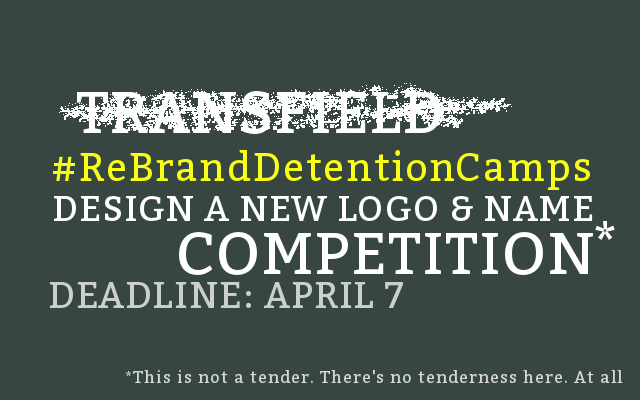 DEADLINE: The deadline will be April 7th, which is when Transfield is slated to resubmit a bid to renew the contracts to run the detention centres on Manus Island and Nauru. PANEL: The judging panel will be comprised of four people elected by those detained on Manus Island and Nauru. You know it makes sense. * Congratulations to Luca and Guido for deciding that art is better than concentration camps, but can you clarify whether the Transfield Foundation will continue to be a joint venture between the detention camp company and Transfield Holdings, please?